The eight-team field for the Old Spice Classic has secured seven teams for the 2011 event to be held Thanksgiving weekend, Thursday, Friday and Sunday, Nov. 24, 25 & 27, at the HP Field House at ESPN Wide World of Sports Complex near Orlando, Fla. The field for the sixth annual Old Spice Classic includes Arizona State, Dayton, DePaul, Fairfield, Minnesota, Texas Tech and Wake Forest. An eighth team will be announced at a later date. Six of the seven teams announced reached the 2010 postseason: Minnesota and Wake Forest played in the NCAA Championship. Dayton won the National Invitation Tournament, plus Arizona State and Texas Tech earned NIT berths. Fairfield participated in the CollegeInsider.com Tournament. 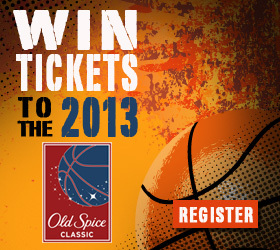 The 2011 Old Spice Classic, a bracket-format tournament, will feature 12 games over the three days. Each team will compete in one game per day, advancing through a bracket-tournament format. The two teams that remain undefeated throughout will face off in a championship match Sunday, Nov. 27. Sponsors include Old Spice, ESPNU and ESPN’s Wide World of Sports. The Metro Atlantic Athletic Conference (MAAC) will serve as the event’s sponsoring conference for the sixth straight year. Florida State won the 2009 Old Spice Classic. Previous winners were Gonzaga in 2008, North Carolina State in 2007 and Arkansas in 2006. ESPN Regional Television, a subsidiary of ESPN, announced today the eight teams in the field for the 2010 Old Spice Classic, to be held on Thanksgiving weekend at the Fieldhouse at ESPN Wide World of Sports® Complex near Orlando, Fla. The field for the fifth annual Old Spice Classic will include Boston College, California, Georgia, Manhattan, Notre Dame, Temple, Texas A&M and Wisconsin. California is ranked No. 23 in this week’s ESPN/USA Today Top 25 Coaches’ Poll, while Notre Dame and Texas A&M also received votes. The Old Spice Classic features four games each day. Each team will compete in one game per day, advancing through a bracket-tournament format. The two teams that remain undefeated throughout will face off in a championship match Sunday, Nov. 28. The tournament is a weekend-long affair at the Walt Disney World Resort, and participating teams are invited to the Walt Disney World Resort Theme Parks and other event functions.